As a parent with kids learning how to roller-skate, it is important to teach your kids the rules of skating. These rules are set in place for several reasons. The most important reason is to ensure the safety of your child and others. Beyond that, following the rules will help your child progress further as a skater. The following list contains a few rules that are a must when teaching your children how to roller-skate. The skating rink is circular for a reason! The rink is designed to control the flow of the skaters. Be sure to tell your child that they are to always skate in a circle, and always skate in the same direction of the other skaters. This will help avoid head on collisions and ensure the safety of all skaters. Your skill level defines the lane you are to stay in. It is extremely common for beginners to hold on to the outer wall as they skate. 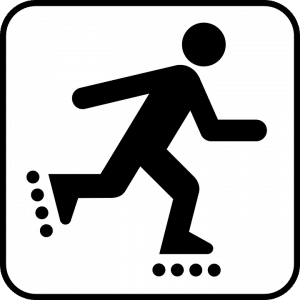 If you are a skilled skater, you are probably going to be faster than beginners, so skate towards the inside of the rink. While there are some rules that are common at all skating rinks, your child must listen to the rules specific to the certain skating rink. The DJ may have important announcements to make, with some of them being fun as they announce new games! These rules are certain to help every skater stay safe and have fun! As a parent it is crucial that you teach your children to follow these rules. Skating at the local skating rink is a fun time in a child’s life. At Skate Moore Skate Center, we recognize this important time and want to make sure everybody is having fun and staying safe.